In writing of the state of landscape photography, post-Ansel Adams, the catalog of the 1990 Whitney Museum of American Art exhibition of “The New American Pastoral. Landscape Photography in the Age of Questioning” stated, “Nearing the end of this century it has become increasingly apparent that the human conquest of nature may not be the cause for celebration it once was; nor can we with any complacency view wilderness as isolated from the effects of our culture. Our expanding presence in and impact on the land, it is argued, has become so pervasive that the boundaries between nature and culture have been all but eradicated. For more than 150 years, American photographers have had a special relationship with the land. The American scenic terrain has been portrayed by them with a passion often approaching the spiritual or the ecstatic. At the same time, however, the significance of these images has also been informed, whether consciously or not, by the changing cultural and moral values of their makers.” In his series, Arcadia Revisited: Niagara River and Falls from Lake Erie to Lake Ontario, photographer John Pfahl (1939-) redefined Arcadia, not in terms of nature but in terms of industry. The insistence upon showing the fate of Arcadia rather than the dream and the promise of Arcadia marked a point of no return for the photographer. 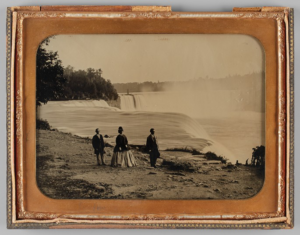 As he wandered the landscape of Niagara Falls, Pfahl could have turned his camera on the rushing river or on the cascading falls or even towards the ever-present mist generated by the impact of falling water upon churning water. But instead, he examined the human use of the River and the Falls themselves, a use which use to be a pilgrimage to a sublime site has become industrialization for the sole purpose of producing power for the east coast. The Burchfield Penny Art Center presented an exhibition of the art of Amos W. Sangster (1833-1904) in 2013 and noted that although he was known as “the painter of the Niagara Frontier” and that he had only two formal art lessons in his life. George Inness described him as “the American Turner.” Born in Ontario, Sangster moved to Buffalo where he began working for the famous Courier Company, making wood engravings. As the gallery noted, “In his off hours, he began spending more and more time outdoors sketching and painting watercolors of well-known landmarks in Erie and Niagara counties.” Although he was working on the “frontier,” a cultural and artistic backwater, the artist seemed to be aware of the atmospheric work of James Whistler and the possibilities of etching. 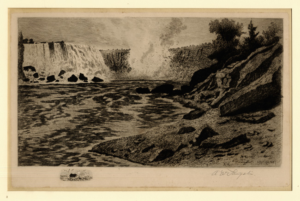 “In 1879, Sangster began working on a collection of original drawings and watercolors on which he would base his monumental series of 153 etchings entitled Niagara River and Falls from Lake Erie to Lake Ontario. Following the entire 36-mile course of the river from one lake to the other, he first sketched his scenes on location and later completed his etchings in his studio.” Niagara Falls was a natural wonder made famous by those who had come before him, from Frederic Edwin Church to hoards of photographers. Sangster was working twenty years later, coming after Church and his photographic counterpart, Platt Babbitt, and what had been a relatively pristine wilderness was being transformed. Sangster not only made over one hundred etchings on copper but he also wrote a book, Niagara River and Falls From Lake Erie to Lake Ontario (1889), about his observations that included one hundred fifty-three original drawings. In writing of the torrents of waters falling off the sharp edge of the cliff, Sangster said, “The gorgeous Cataract of Niagara, a thing of beauty forever, equally lavish of its inspirations and its charms upon all comers, is always stupendous, and always glorious, and its beauties and splendors are as sublime and overwhelming to one really sympathetic admirer as to another. All its praises must be sung in the same key. Monopoly of expression before such a majestic spectacle is no more admissible than monopoly of emotion.” Although Pfhal noted that as Sangster was drawing the environs of the River, “He wasn’t afraid to show industry. He included a smokestack set within an idyllic landscape. The 19th century had a very ambivalent attitude about industrialization. They were proud of it, and only later did they realize the problems that came with it,” the artist himself did not write about industrialization. Beyond the origins of Arcadia’s return as a topic in modern literature, the other main characteristic of Arcadia is that on one hand, it is lost, while on the other hand, this is a real site, with an actual history. Although it is shrouded in myth and supposedly inhabited by Greek Gods and Goddesses, there was an actual Arcadia in Greece, and by the Augustan era in the Roman Empire, the region was already the subject of nostalgic searches. 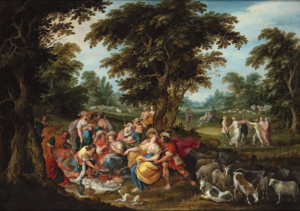 Julie Baleriaux’s article, “Pausanias’ Arcadia Between Conservatism and Innovation,” recounted that “Arcadia was so old that it had witnessed the birth of Zeus and Poseidon, Cronus’ feast on his children, and was the place where the first human, Pelasgus, was born. One of his first descendants, the Arcadian king Lycaon, established the first city on earth–Lycosura–at the foot of Mount Lycaeus. he founded the cult of Lycaean Zeus at the top of the same mountain and instituted here the oldest games in the Greek world, the Lycaean games.” Pausanias was a Roman traveler, fascinated with ancient Greece. He explored the ruins of Arcadia, which had been recently conquered and brutally by Rome. Arcadia was ancient, its religious roots stretched back to prehistoric times. “The early settlement pattern or Arcadia was largely scattered: people living off pastoralism in the mountains of western and central Arcadia were organized in fluid groups which gathered at shared sanctuaries. Nucleated settlements–poleis–appeared in the classical period.” Over time, the region drifted towards urban areas, leaving behind empty villages when the rural settlements were abandoned during the 4th century. “Despite the ruined and empty appearance of rural Arcadia, Pausanias records a number of lively traditional cults all over the countryside.” The gods of the countryside migrated to the urban areas where the traditional cults continued over the centuries and were still active and practicing religions even upon the arrival of the Romans. The rural sanctuaries remained, often because the God was connected to a site which could not be moved. Arcadia, then, was not a dream or a utopia but was historically a real place, whose mythology is part of Greek mythology, its inhabitants and those who participated in the events of the ancient history of the Bronze Age were well known in oral histories passed on as tales of the Gods. 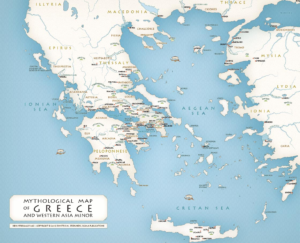 As the region passed from its storied past, it evolved from small towns to large cities, from small tribes to ruling monarchs, until the area was taken over by Sparta and then the Romans. The very soil, the groves, the rocks, the mountains remained imbued with the spirits of the primordial gods and goddesses who haunted the region. Like Arcadia itself, the pristine scenery of Niagara Falls and the Niagara River would evolve. Although the upstate New York region that Pfahl revisited did not have the sacred significance of Arcadia, the photographer was like a modern-day Pausanias, an inhabitant of a sophisticated empire, seeking the source of a national mythology. 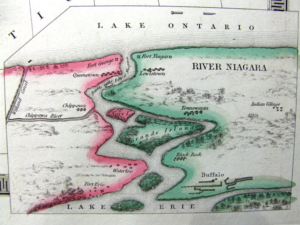 The actual history of the Niagara River traversed by Pfahl will be discussed in the next post.